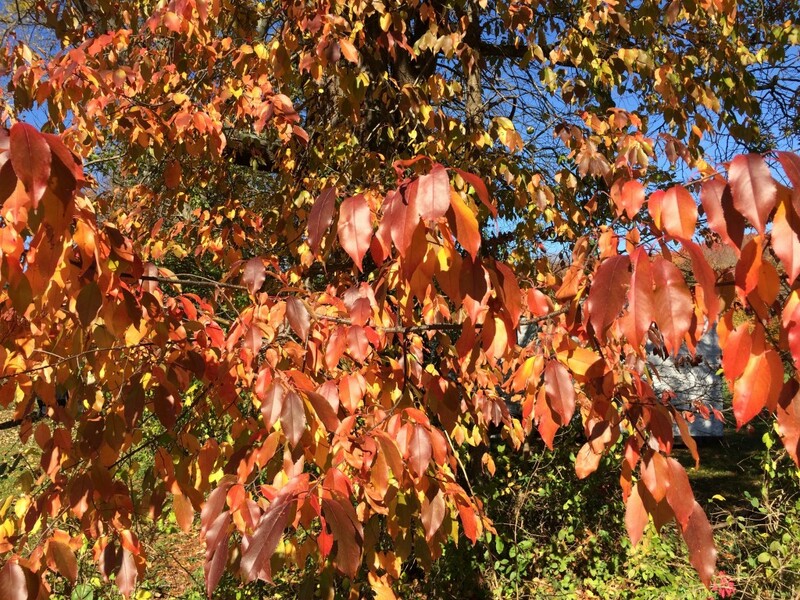 Prunus serotina.Paul S. Carter, hosted by the USDA-NRCS PLANTS Database. ( Accessed 9/2014). Prunus serotina is a tree to 30 m tall, 70 cm diameter (Yatskievych 2006); lives to 100 years; fast growing, often weedy; trunk often crooked, roots shallow, spreading (Mulligan and Munroe 1981) associated with arbuscular mycorrhizal fungi (Decker and Boerner 1997); mature bark black, rough, flaky, young bark shiny, dark reddish-black with horizontal lenticels, twigs dark gray, sprinkled with tiny pale dots (lenticels); inner bark, twigs and foliage unpleasantly aromatic when crushed; winter buds roughly 0.4 cm long, sharply pointed, scales red-brown, overlapping; leaf scars alternate, oval, wider than long, about 0.3 cm wide, vein scars 3 (Mulligan and Munroe 1981; Covell 1984); growth pattern indeterminate (Gargiullo personal observation). Leaves alternate, 6-12 cm long, 2-5 cm wide, elliptic to lance-shaped, surface shiny, midrib brown-hairy below, tip pointed, base rounded to wedge-shaped (Radford et al. 1968); margin finely toothed, tooth tips blunt, bearing small, dark extra-floral nectaries; leaves expand early-mid May, pink stipules conspicuous at base stalks; autumn leafs yellow-orange-red; winter plant leafless 154 days (Britton 1874). Prunus serotina.black-knot fungal infection.eol.org. (Accessed 9/2014). Flowers white, small, sweetly scented, radially symmetrical, petals 5, 0.4-0.6 cm long, deciduous, calyx lobes triangular, tips, about 0.1 cm long, sharply pointed, persistent, stamens longer than petals, ovary superior (Radford et al. 1968); inflorescence spike-like, (racemes), crowded, about 10 cm long; blooms May; pollinated by bees, some flies and a beetle (Mulligan and Munro 1981). Fruit fleshy, becoming red then black at maturity, 0.7-1 cm wide, one-seeded, astringent-sweet, old calyx lobes persistent at base; matures July-Aug. Seed load 18%. pulp contents; water 77%, lipid <1%, protein 4%, CHO 62% (White 1989); fruit eaten and seeds dispersed by numerous birds and mammals (Martin et al., 1951). Seeds must overwinter before germinating, numerous in seed bank, viable in soil 3-5 years. Most seeds germinate the second spring after dispersal. Germinating endosperm swells, and splits the stony endocarp. Small seedlings often have opposite leaves (Gargiullo personal observation); shade intolerant (Grime 1965), but seedlings survive for decades under closed canopy (Mulligan and Munro 1981). Frequency in NYC: Very common. The most common woody plant in the New York City region (Clemants 1999). Habitat: Open areas, wetland edges, forest gaps, a woody pioneer on fill and poor soil. Can sprout from root crown or stumps. Tolerates soil pH of 3.9-8.0 (Greller et al. 1990; Hightshoe 1988). In NYC found on soil with pH 4.3-7.7 (Gargiullo unpublished data). Tolerant of drought, salt. Intolerant of flooding, soil compaction; relatively intolerant of shade, index 2.4 (Hightshoe 1988); but saplings and seedling are a common component of forest understories. Prunus serotina.David G. Smith.delawarewildflowers.org (Accessed 3/2016). Notes: Stump sprouts if cut or burned. Black cherry is very susceptible to fire. Stems often girdled by mice and voles, seedlings eaten by rabbits and deer. Extra-floral nectaries of new leaves are active, and fed on by the predacious red-headed ant, Formica obscuripes. At this time of year small eastern tent caterpillars, Malacosoma americanum, (Lasiocampidae), are starting to feed on black cherry leaves and are fed upon by the ant. 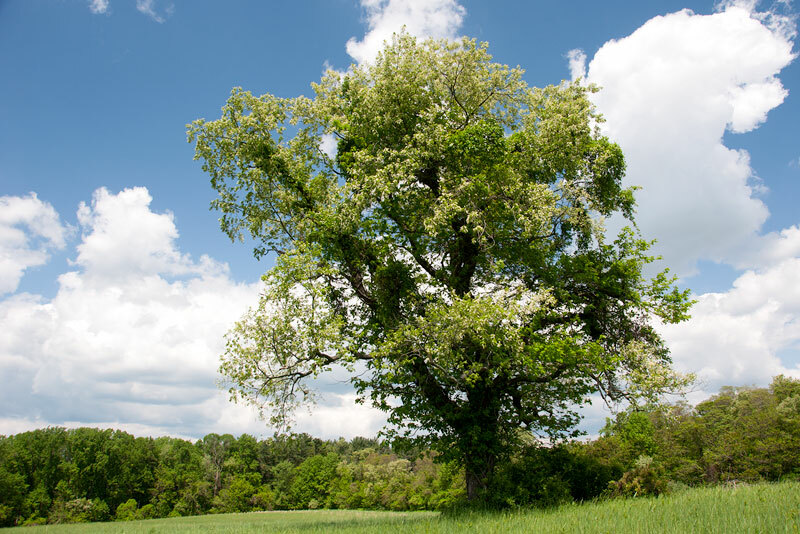 Black cherry can often be defoliated by eastern tent caterpillars. The larvae spin dense, whitish, tent-like webs in branch forks, after emerging from pupation and mating, adult moths lay dark, smooth, glossy egg masses on host trees in mid summer, larvae emerge with leaves in spring (University Illinois 2002; Tallamy 2003; Covell 1984). Later flushes of leaves eaten by the cherry scallop shell moth larvae, Hydria prunivorata (Geometridae). The eggs hatch from July to August and larvae form tube-like nests of leaves, held by webbing along the margins. They feed on the leaf surfaces. When populations reach high levels, the eggs are killed by parasitic wasps in the genus Telenomes (Hymenoptera). The moth larvae are also often parasitized by the braconid wasp Apanteles acaudus (Hymenoptera). However, this insect is host to the ichneumonid hyperparasite Lysibia mandibularis (Hymenoptera) which prevents it from substantially reducing moth larvae populations. A number of other ichneumonid wasps also parasitize the moth larvae (Schultz and Allen 1975; Omer and Allen-Reid 2002; Allen 2002; Covell 1984). Trees weakened by defoliation may be invaded by the peach bark beetle, Phloeotribus liminaris. 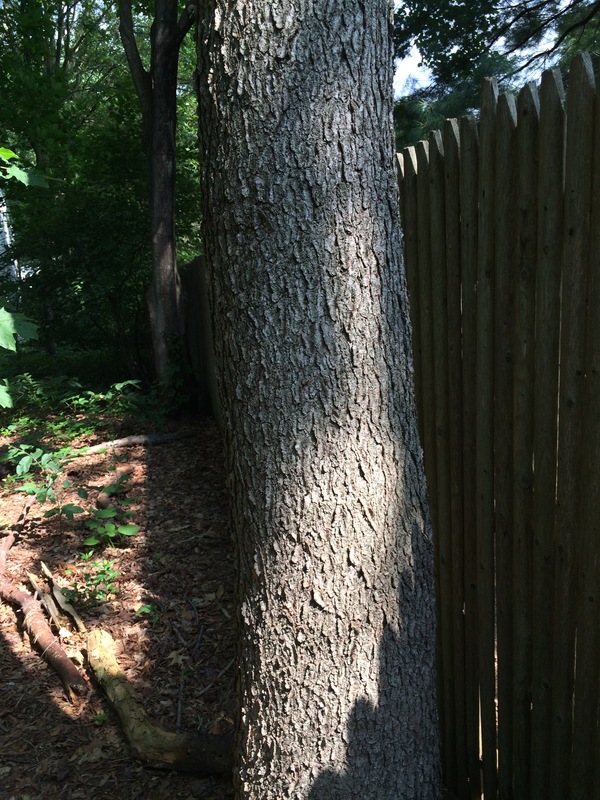 healthy trees resist invasion with copious, gummy sap. Gum also exuded at wounds caused by the Prunus miner, Phytobia prune (Diptera) and a scolytid bark beetle, Dryocoetes betulae (Scolytidae). Black cherry is attacked by larvae of many other moths and butterflies (Lepidoptera) including; spotted Apatelodes moth, Apatelodes torrefacta (Apatelodidae); banded tussock moth, Halysidota tessellaris (Arctiidae); saddleback caterpillar moth, Sibine stimulea (Limacodidae); black-etched prominent, Cerura scitiscripta (Notodontidae); yellow-necked caterpillar moth, Datana ministry (Notodontidae); promethea moth, Callosamia promethea, (Saturniidae); wild cherry sphinx, Sphinx drupiferarum (Sphingidae); small-eyed sphinx, Paonias myops (Sphingidae); Cecropia moth, Hyalophora cecropia (Saturniidae); the uglynest caterpillar, Archips cerasivoranus (Tortricidae); gypsy moth, Lymantria dispar (Lymantriidae); a mining, casebearer, moth, Coleophora malivorella (Coleophoridae); the fall cankerworm, Alsophila pometaria (Geometridae); half-wing geometer, Phigalia titea (Geometridae); speckled green fruitworm, Orthosia hibisci (Noctuidae); the tiger swallowtail butterfly, Papilio gaucus (Papilionidae); red-spotted purple butterfly, Limenitis arthemis astyanax; (Nymphalidae); coral hairstreak Harkenclenus titus (Lycaenidae); (Covell 1984; Pyle 1981; Struttmann 2003; Tallamy 2003). 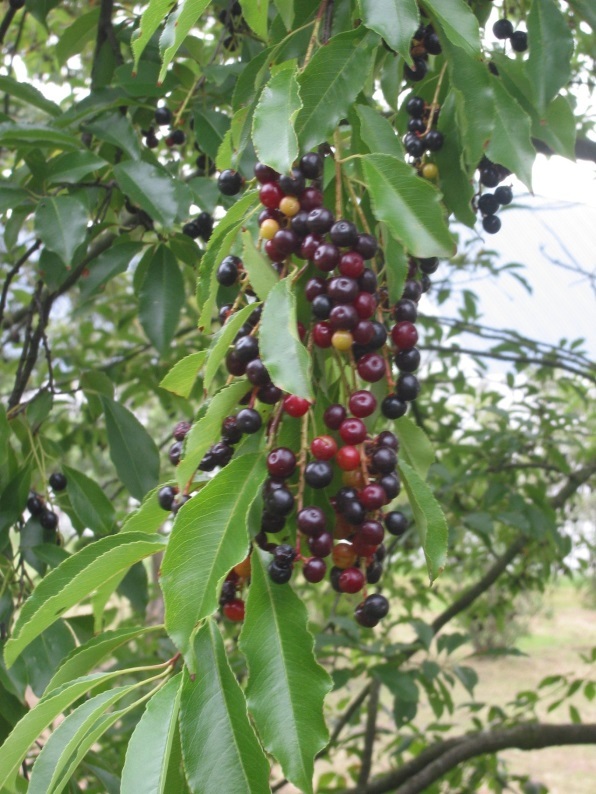 Black cherry is also attacked by Cecidomyia serotinae (Diptera), a gall midge. The leaves are also often attacked by a gall-maker producing elongate, spindle or narrowly club shaped, curved leaf galls about 1cm long, that often turn red; may be caused by a midge. 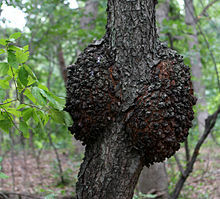 The gall is lined with minute, featureless, moving larvae, which appear to turn brown as pupae (Gargiullo, personal observation). Black knot fungus, Apiosporina morbosa (Ascomycotina) causes black, rough, gall-like swellings along branches, usually kills branch above diseased site. Coccomyces lutescens (Ascomycotina) causes cherry leaf spot. Black cherry also sometimes infected by the necrotic ringspot virus. Establishment of seedling is inhibited by allelopathic chemicals from rough goldenrod (Solidago rugosa) and bracken fern (Pteridium aquilinum). Leaves contain prunasin, a cyanogenetic glycoside that breaks down to form hydrocyanic acid, seeds, new spring leaves and wilted leaves are particularly toxic (Agrios 1988; Burns and Honkala 1990; Covell 1984; Kingsbury 1964; Mulligan and Munro 1981; Sinclair et al., 1987). Wood used extensively for furniture making. .